Background and Objective: Today, Wi-Fi technology is practically being used as a default connectivity solution for many new technologies and concepts like Internet of Things (IoT) and Smart City. The design of Wi-Fi network is a complex problem, where it is necessary to decide about the location and number of access points in given indoor or outdoor environment. 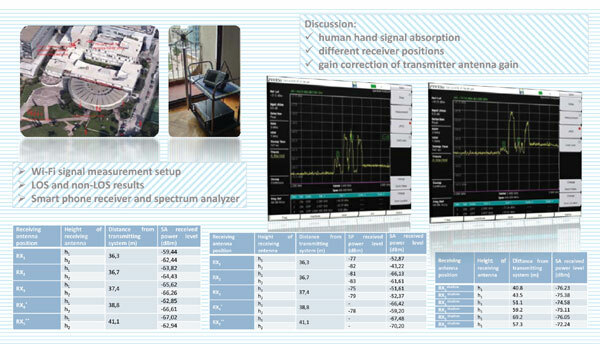 Method and Results: In this paper, the measurement results of Wi-Fi signal in the indoor-to-outdoor building environment are investigated and possible sources of signal loss in the examined Wi-Fi channel are pointed out and discussed. The influence of human hand signal absorption is examined by comparison of the measurements performed by professional equipment with the ones obtained by a smartphone. We considered different receiver positions as well as the change of transmitter antenna gain with respect to the receiver height. Conclusion: The gain correction was estimated, and results showed a good agreement between the calculated and measured power levels at the receiver. Building surrounding, channel loss, human hand signal absorption, line of sight propagation, outdoor radio propagation, indoor radio propagation, radio measurements, spectrum analyzer, Wi-Fi signal.